460 Aviation Social Media and Freelance Writing - Airplane Geeks Podcast - The weekly audio podcast that explores and expands your passion for aviation. Dan Pimentel tells us about the #Oshbash social media meetup coming up at Airventure Oshkosh 2017. We also look into freelance writing for aviation publications and the Airplanista Aviation Blog. In the news, we talk about support for supersonic civil air travel in the FAA reauthorization bills before Congress, ATC privatization, United Airlines in the press again, and Turkey’s first female professional acrobatics pilot. Dan Pimentel is a long-time aviation journalist, photographer, and graphic designer. 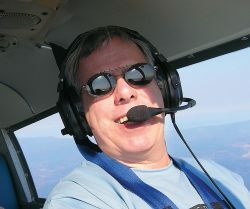 He is the founder/publisher/editor of the Airplanista Aviation Blog, and you can find his features, columns and news items in publications like Flying Magazine, AOPA Pilot, EAA Sport Aviation, Air & Space Smithsonian, HAI’s Rotor Magazine, Cessna Flyer, and Piper Flyer Magazine. Dan tells us about the Airplanista #Oshbash Social Media Meetup and Networking Event at Airventure Oshkosh 2017. This year’s #Oshbash is sponsored by Aircraft Spruce & Specialty. We also explore freelance writing for aviation publications, look at the process, and learn some tips for success. Along the way, we discuss ATC privatization, rivets and clecos, preserving EAA history, the importance of collegiate aviation programs, and how airshow performers physically and mentally prepare for the task. A middle school teacher traveling from Hawaii to a teacher’s conference in Boston purchased a ticket for herself, and one for her two-year-old 25-pound son. Waiting onboard the Houston to Boston leg, she was told another passenger had a valid boarding pass for the son’s seat. Rather than make a scene, the boy flew on her lap for the 3 ½ hour flight. According to a United spokesman, the boy’s boarding pass scan had been unsuccessful and he wasn’t logged in to the system. His seat was released to a standby passenger. 26-year-old Semin Öztürk is Turkey’s first female professional aerobatics pilot. She flew to great acclaim at a recent air show organized by the International Sportive Aviation Center and featuring 25 acrobatic pilots from Turkey. She began flying when she was 12 years old and her father was also an aerobatics pilot. 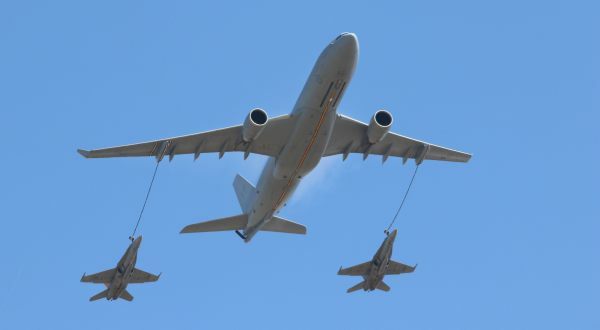 The KC30A RAAF tanker and two F/A18s at Australian International Airshow, courtesy Philip from Melbourne, Australia. 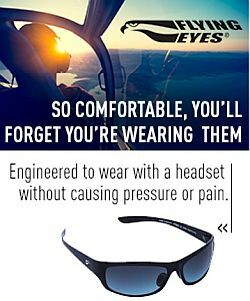 This entry was posted in Episodes and tagged aerobatics, AirVenture, ATC, FAA, Social media, supersonic, United Airlines on July 12, 2017 by maxflight.